1.19 Cr (Negotiable) 5600 per Sq. Ft.
No matter where it goes, whatever be the weather, the sunflower always brings its own sunshine, much like the Oasis brings to life a sweltering desert. ..
1.6 Cr (Negotiable) 5600 per Sq. 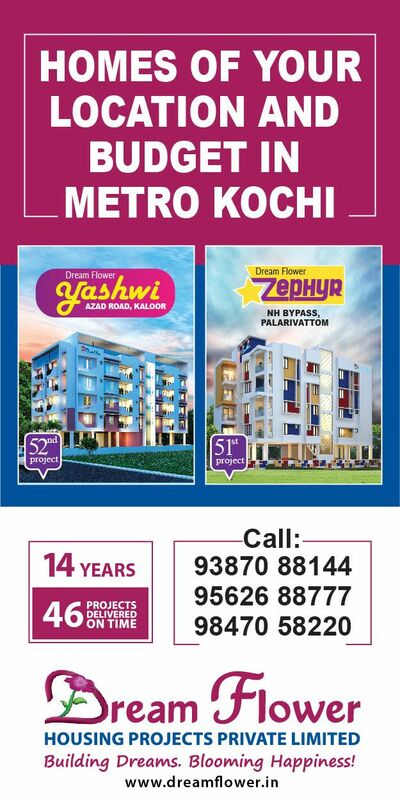 Ft.
Dreamflower Inaaya at Ponekkara, just 900m from Edappally Metro Station. There will be a total of 16 Flats (8 units of 2BHK and 8 unit of 3BHK) in 14.5 Cents of la..
1.05 Cr (Negotiable) 6912.44 per Sq. Ft. Welcome to a world where you have every luxury and pleasure you could ask for, and the time to enjoy it. Welcome to Veegaland Exotica, where well-planned and elega..
1.57 Cr (Negotiable) 7647.35 per Sq. Ft.
75 Lac (Negotiable) 7197.7 per Sq. Ft.
Velvetude – 3 is a brand new Apartment located near Lulu Mall just 700m from Metro Pillar No. 379. There are 16 flats in 16 cents of land. All flats are semi furn..
62.44 Lac (Negotiable) 5600 per Sq. Ft.
Asset Limelight is located between Lulu mall and Amrita Hospital, on the side of Old NH 17. it is developed in 43.35 cents of land with 47spread across in B+ G..